The Yoshimoto Cube is a mechanical puzzle toy invented by Naoki Yoshimoto in 1971. 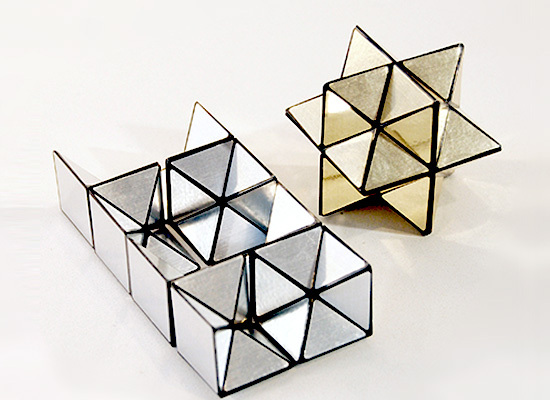 Yoshimoto first introduced his cube in 1972 at a solo exhibition entitled “From Cube to Space,” and later developed three commercial versions. In 1982, Yoshimoto Cube No. 1 was included in the Museum of Modern Art’s permanent collection. The cube is made up of eight interconnected cubes which can be folded or unfolded indefinitely. The unfolded cube can be dissected and reassembled into two stellated rhombic dodecahedrons, each of which comprise half the volume of the original cube, making it a kind of three-dimensional dissection puzzle.